Dalmeny is a small village located immediately to the south east of Queensferry, and just north of the A90 linking Edinburgh to the Forth Road Bridge some three miles north west of the city bypass. 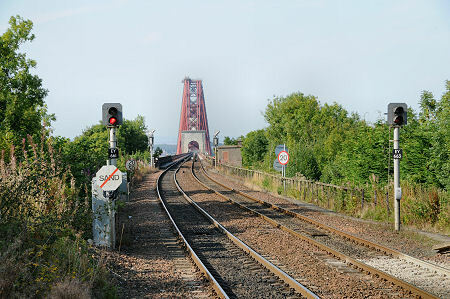 It is a remarkably tranquil oasis given that the A90 passes just to the south, the M9 terminates a little to the south west en route to the road bridge, and the main railway line leading to the southern end of the Forth Rail Bridge passes immediately to the west of the village. As if this were not enough, a quarter of a mile south of the village, on the opposite side of the A90, is the Dalmeny Fuel Depot. This was built in the 1970s on the site of a disused oil shale mine and refinery, and screened by a high grassy embankment formed from oil shale waste. It stores up to 4 million barrels of refined petroleum products piped from the Grangemouth oil refinery, en route to export via the Hound Point tanker terminal in the River Forth to the north east. A little further to the south west of the village is the Royal Elizabeth Yard, originally established as a stores base for the Royal Navy, but now a commercial trading estate. All this could combine to make Dalmeny appear a less than attractive location, but once you have found the village (and doing so is not straightforward as it stands on remnants of a much older road network that now exists only as minor roads) you find somewhere that could easily be standing in a deeply rural setting and the surrounding activity is largely, and oddly, invisible. An attractive location so close to Edinburgh inevitably means that Dalmeny is highly favoured as a residential base by people working in the city, and yet even this has left the core of the village surprisingly unscathed. 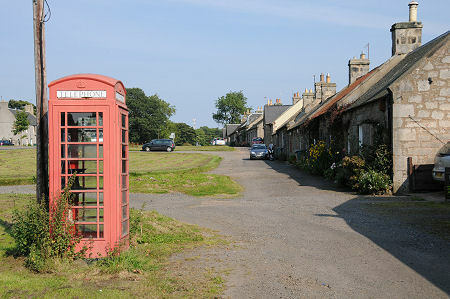 At the heart of Dalmeny is its broad village green, lined with cottages and houses. The buildings are attractive, and unspoiled, and when combined with the timeless appearance of the faded red phone box and, when we visited, washing hanging on the drying green at one end of the cottages, give a sense of being transported back in time by half a century. This impression is greatly enhanced because Dalmeny never appears to be overrun by cars, either parked or passing through. The core of the village dates back to the early 1800s. It was planned as an estate village to serve the new Dalmeny House, built between 1814 and 1817, and overlooking the River Forth a mile and a half to the east. Until then the resident Earls of Rosebery had lived in the medieval Barnbougle Castle, standing on the shore of the river. 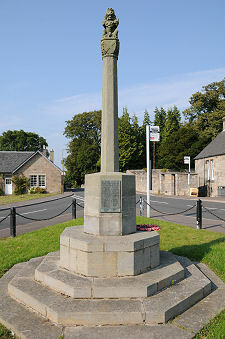 Part of the village green is home to a war memorial erected in 1920, whose deliberate likeness to a mercat cross gives the impression that the village might have a much older history. While the mercat cross is an illusion, the story of Dalmeny does indeed go back far beyond the building of Dalmeny House. Standing on the north side of the village is St Cuthbert's Parish Church, Dalmeny. St Cuthbert's is the best preserved Norman parish church in Scotland, and its Romanesque architecture is a real joy, both externally and internally. St Cuthbert's Church was probably built in about 1160 by Gospatric III, Earl of Lothian, the grandson of Gospatric, Earl of Northumbria, who had fled into exile in Scotland following the Norman conquest of England. This is a little speculative, but Gospatric III owned estates in the area and was known as an important religious patron. And if there was an important church here as early as 1160, it seems reasonably to assume there must have been a population living here to attend it. New housing in the 1900s saw Dalmeny expand to the south, almost as far as the A90, and there have been more recent housing developments in and around the village, most fitting in very well, and non (yet, at least) spoiling the essential "village" feel of the place. Meanwhile, "Dalmeny Station", close to the southern end of the Forth Rail Bridge, is half a mile from the village and actually rather closer to Queensferry.